As we walked by the hut, the inn keeper called for us to come in for a moment of refreshment. Sitting there sipping warm tea, we began to share about Jesus being the only way to God. The truck drivers who were scattered throughout the inn gathered to hear what these men carrying this weird looking piece of wood had to say. After sharing the need to repent of sin and trust Jesus as the only way to God, the inn keeper gave his heart to Jesus. For follow up, we gave him a Bible and explained to him the need to make the Bible and prayer to Jesus his daily spiritual food. Although there is no fellowship nearby for him to attend, our team members have checked on him several times, and he is still going strong for Jesus. This is just a small example of what God has done as we've walked across India with the Cross. Our call is fourfold. First, we walk with the Cross and intercede. Second, we preach the Gospel and evangelize. Third, we disciple new converts in the BASIC Bible principles of personal life, family life, church life, evangelism, and discipleship. Finally, we try to provide ongoing literature and training so believers can reach their neighborhoods, schools, and co-workers with the gospel. Our goal is that every believer become a man or woman with a Jesus message; able to live for Jesus, share Jesus, and help others live for Jesus. Our desire is that every Christian home become a house of prayer and ministry. We know from scripture that this is the most effective way to reach communities, nations, and the world for Jesus. In 1986 we began walking across India with nothing but a backpack and the Cross. Many thought it could not be done. But, God has given grace as we have walked from village to village, eating the food, drinking the water, and ministering to hungry souls who've never heard the Gospel. We have seen God move in miraculous ways: healings, deliverances, and tremendous crowds gathering to hear The Gospel. This has led to numerous decisions for Christ, and several churches have been started. Through it all we have seen an increase in vision and greater boldness among the Indian believers. We've also gained a greater vision for what God wants to do in India. Part of what we do is train nationals who accompany us as we walk. The purpose is to prepare a gospel team who will stay behind to plant a new church in villages that are responsive while we continue the walk. Every team on the front line needs a support team. To help us with the walk we need intercessors, and individuals or churches who will give regularly. 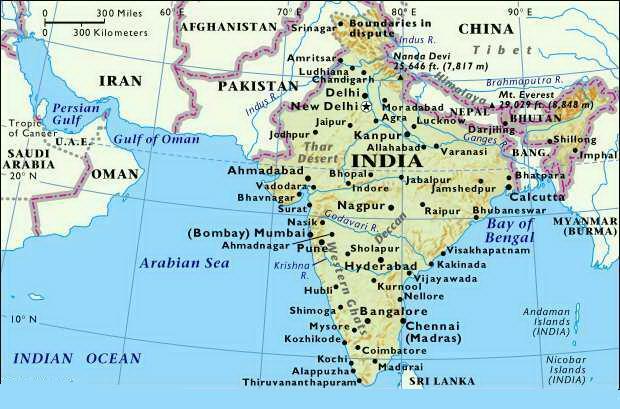 Also, we are looking for those who are willing to be trained in evangelism and church planting to travel with us, and assist the Indian teams as we walk. Please pray for the Crosswalk, and what God would have you do as part of the team. If you would like to know more about how to be on the team, click here. You can see what God has already done by clicking on the maps below.